A racehorse trainer who broke a bone in his neck when his car hit a telegraph pole in Dorset has undergone surgery. Robert Alner, 63, was reported to be in "good spirits" before being taken into the operating theatre. The Cheltenham Gold Cup-winning trainer was trapped in his Peugeot 406 after the accident near his yard in Droop, outside Sturminster Newton. Alner, who had to be cut free, had surgery on Friday at Frenchay Hospital in Bristol. Jockey Andrew Thornton, who has long been associated with the handler, said he had been in contact with Mr Alner's wife, Sally, who said he was in good spirits and had totally accepted what had happened to him. "Obviously we don't know what the outcome will be, it's a slow process but he's in good form and is very positive. "We will know more tomorrow but he remembers everything that happened which has got to be a good thing," he added. 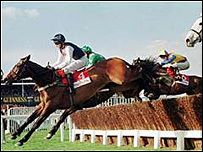 The trainer gained Gold Cup victory with the 25-1 shot Cool Dawn in 1998. Mr Alner rode 53 winners as an amateur and trained Sir Rembrandt who finished second and third in the Gold Cup in 2004 and 2005 respectively.